NOTICE: AZTaxes.gov will be unavailable on Friday, April 26th, 2019 from 5:30 p.m. until 12:00 a.m. (midnight), or until maintenance is complete, for scheduled system maintenance. We apologize for any inconvenience this may cause. Bingo is legal in the state of Arizona for recreational purposes, or to allow certain types of nonprofit organizations to generate funds to support their activities. However, special laws govern the way bingo is conducted. The Arizona Department of Revenue enforces these laws. Taxpayers who fail to comply with bingo laws and rules could lose their license to conduct games. Because criminal charges can result from non-compliance, the department encourages prospective licensees to obtain copies of the bingo laws and rules and become familiar with the requirements. All bingo licenses expire one year from the date of issue. To continue conducting bingo games, you must renew your license prior to the expiration date. 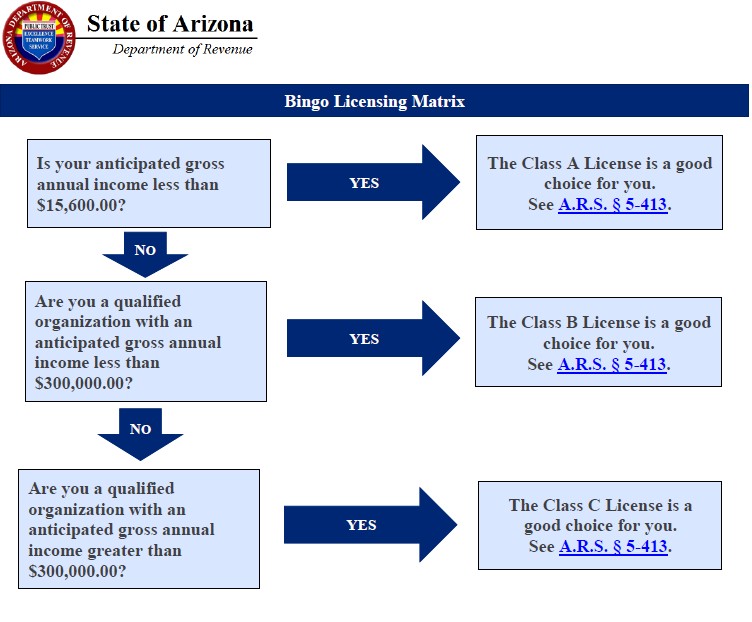 If looking to renew your license, email the Bingo Unit at [email protected], or call (602)716-7801. If looking to apply for a new license, click here. The tax on state licensed bingo operations is based on a multitiered licensing structure. There are three classes of bingo licenses, each of which has a different tax rate. Each licensee's tax rate is based on bingo receipts. Class A licensees generally obtain a license for recreational and social purposes, returning all gross receipts to the players in prizes. Class A licensees cannot exceed $15,600 per year in gross receipts and they are taxed at 2.5 percent of their adjusted gross receipts. That is the amount left, if any, after paying prizes. Class B and Class C licensees are dedicated to raising funds for their sponsoring charitable organizations. They are taxed on their gross receipts, not their adjusted gross receipts. Class B licensees, whose gross receipts do not exceed $300,000, are taxed at 1.5 percent. Class C licensees, whose gross receipts exceed $300,000 per year, are taxed at 2 percent of their gross receipts. All taxes collected from bingo licensees are deposited into the state general fund.